There are however, lots of great recipes in the book - a very high percentage of which are vegetarian, or could be adapted to be vegetarian. When I came across these Palmiers, I thought that they looked really easy to make and would also taste delicious. I am happy to report that I was right. I used fresh chives rather than fresh thyme to make them and I also used pre-bought store puff pastry which is always handy to have in the house. Rather than cutting the sun dried tomatoes and chives with a knife, I used some kitchen scissors to chop them up which I always think is much quicker and easier. 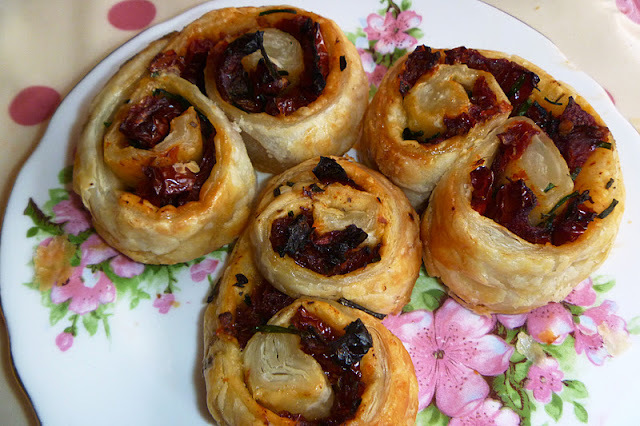 These Palmiers make a great after school snack, and also make great Canapes too for the grown-ups. 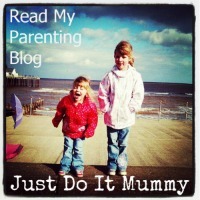 I will be cooking more recipes from Baking Made Easy and will report back to let you know how I got on! Roll out the ready made Puff Pastry and lightly brush with the beaten egg. 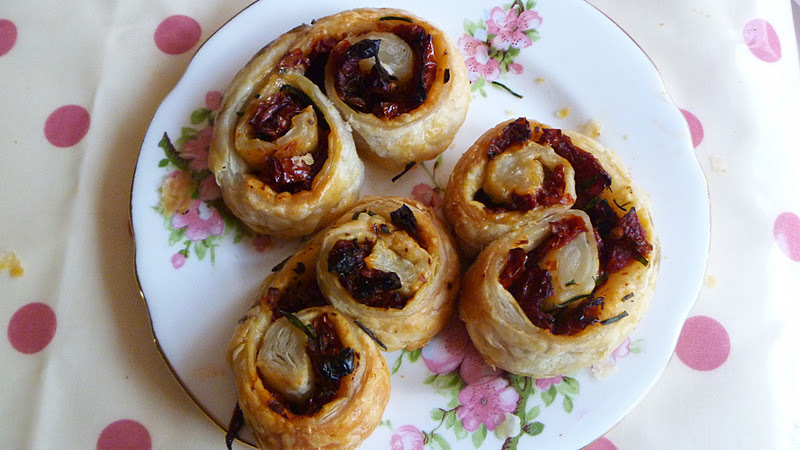 Cut the sun dried tomatoes up into small pieces and place them evenly over the puff pastry. 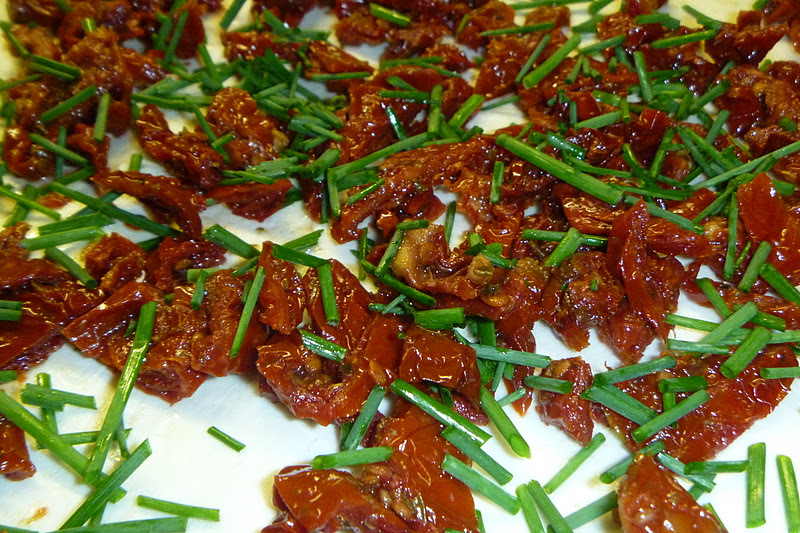 Cut the chives and sprinkle them evenly over the sun dried tomatoes. Now it is time to roll up the pastry. Take the two longest ends of the pastry and gently roll them towards each other to meet in the middle. Stick the two halves together by brushing some beaten egg down the middle of the pastry. Put the pastry onto a baking tray and place in the fridge for 30 minutes to allow the pastry to harden a little. Meanwhile, pre-heat the oven to 200 degrees celsius. After 30 minutes remove the roll from the fridge and slice into 1cm thick pieces. Lay the pieces on a baking tray and brush with some more beaten egg. Bake in the pre-heated oven for 10 to 15 minutes, or until the pastry is crisp and golden. Remove the Palmiers from the oven and leave to cool on a baking tray. Great recipe, I am going to share it with my wife. 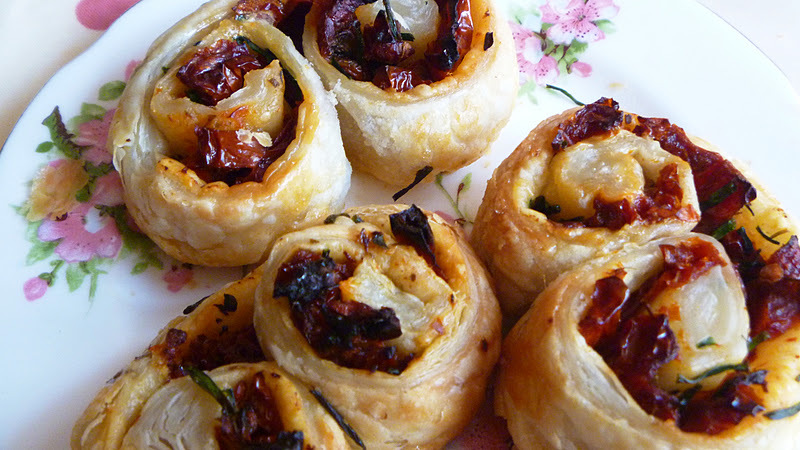 These look great, I make these with tomato, cheese and basil and sometimes with pesto. Thanks Susan, good idea to vary the ingredients. There are lots of similar recipes on my site which use tomato, cheese and basil as they are my three favourite ingredients to cook with and I can see that they would work well here too. Pesto would be good also, I got a new pestle and mortar for Christmas and so may have a go at making my own pesto as the shop versions are not always truly veggie. Thanks for stopping by! These really do look a treat Claire, thanks for letting me know about them. Love the flavours and think Lorraine Pascale is a top cook. Have you tried her brownies or flapjacks.....amazing! !